There are many good coolers out there that can be used by those that appreciate what the outdoors have to offer. With the weather changes from cold winter to warm spring and summer, you’ll find coolers everywhere. Some will use them to hold beers and soft drinks while sitting on the porch or backyard, while others will use coolers like yeti to hold ice during camping trips in the wilderness. Before we get to the most outstanding coolers on the market, keep in mind that they’re sometimes called ice box, ice chest, etc. How will you be using the Cooler? Coolers come in all shapes and sizes, which sometimes make it difficult to select the ideal product from the cooler brands found online. What you need the cooler for will determine what features you want the cooler to come with. 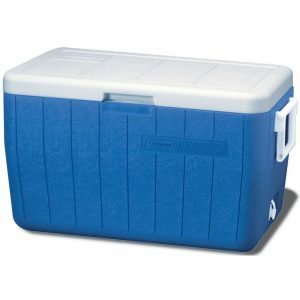 If you’re just looking for a cooler to hold ice for several days the size requirements will be far different from the ones designed to keep cold beer and other beverages. Size is another feature that will help determine the cost of the cooler you have in mind. 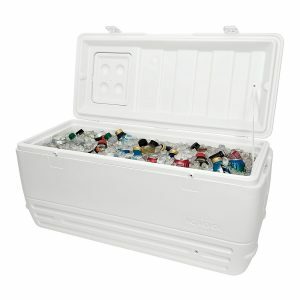 As you can tell, the cooler size will be influenced by what you’ll be using it for, and how many people in your camping party. Your ice needs will be little if it is just for two as compared to serving the needs of several people on a boat ride. It makes sense to get a cooler brand that is slightly larger than what you intend to use it for. From my outdoor camping experience, you can end up with a camping cooler that is too small, but it can never be too big. Coolers might look easy to you, but it is the materials it is made out of that will determine how long it can hold ice or keep drinks cold. I have a yeti cooler, but there are many other brands with similar features that can keep ice solid for several days and your beverages cold for several hours. The materials that the cooler is made out of will also determine the cost. Those made out of Styrofoam, which is a type of polystyrene material that can expand, will cost you less than one constructed from tough stainless steel materials. Coolers made out of tough reinforced plastic materials will last many decades and most likely will never leak if cared for the right way. So, keep in mind, cost and best coolers on the market are interrelated. In this niche industry, you get what you pay for. What about Top Cooler Brands? The top cooler brand name is yeti, but there are dozens of other brands with similar performance metrics. While some might consider the yeti cooler as too expensive, I can assure you that it performs flawlessly at keeping ice solid for several days, and can hold cold drinks at the right temperature for long periods of time. Within this cooler reviews, I have listed products that can be compared to yeti in both build and performance metrics. Despite all the hoopla about the best cooler brands on the market, the one that performs the way you want it to, should be the ideal cooler for you and your camping party. What about the Cooler Warranty? The warranty terms for coolers will vary from brand to brand, but the average warranty length is usually one year or less. Coolers do not come with many moving parts, so malfunction is not that common, but some might leak after a period of time, especially if not handled the right way. Just like everything else sold online these days, there are good products and poorly designed coolers. Despite some of the glowing cooler reviews you might have read online, it is prudent on your part to read some of the feedbacks from current users. The reason why, is not to find a product that is universally beloved, for that does not exist, but you do want one with a solid approval rating from a majority of the current users. I have found that good cooler brands do generate excellent feedbacks from most of the current users over time. There are dozens of cooler brand names in this competitive industry, and you can be sure many more are in the planning stages in this lucrative niche market. I do go on several camping trips during the year, and the cooler brands listed I am very familiar with. The number one cooler for your needs will be based on how you intend to use it. If you want one to just hold ice solid for several days, all the products reviewed will do an excellent job. Keeping beverages cold for hours at a time will require you get a large sized cooler for such needs. Everywhere you go people are talking about the Yeti brand. The only downside to any product from this brand based on the Yeti cooler reviews I read online is the high pricing. It is not called the alpha beach cooler because it is fancy, for it is designed to outperform other brands. Among all the high-end coolers, the Yeti Hopper portable cooler should get a gold star for innovative design and consumer-friendly features. This product is available in six different colors including my favorite dark silver with black handles. Just look at the design of the handle for this yeti cooler? It looks more like a high-end handbag than a cooler, which makes it the most fashionable cooler one can take to the beach on any hot summer days. The shoulder strap is double stitched and the insulation included with this cooler is top notch. I kid you not by saying this unit outsells any other products made by this company. The Coleman brand is a significant player when it comes to dependable coolers in the marketplace. While the simple design might not win any awards, the ability of the Coleman 48-Quart cooler to hold up to 63-cans should impress any outdoor enthusiast. The powerful insulation materials used are free of all ozone-depleting elements. The hinged lid is set up in such a way that it is easy to open and close it. This product is designed to be resistant to rust elements. 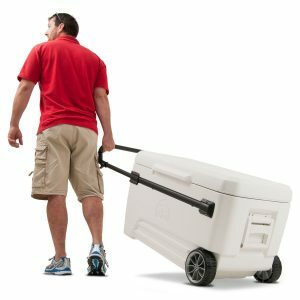 Another good reason to consider the Coleman brand the cooler to get if you think the Yeti brand is too pricey is the attached durable two-way handles. It is available in two unique colors. Some have called it the best ice chest alternative to the pricey yeti brand. This is the same brand that brings you tough plastic containers to hold food ingredients. 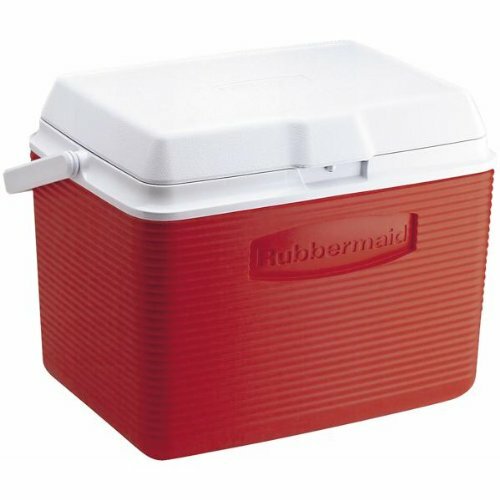 The Rubbermaid cooler is available in two unique colors and six different sizes. The included handles are designed to swing up, which makes it easier to carry the cooler even on a full load. It has the right type of thermal insulation to ensure beverages and food are kept at the right cold temperature. The materials used to make this Rubbermaid ice chest gives it the ability to resist environmental elements that can cause odors and stains. The sturdy construction includes a built-in liner that is easy to keep clean. This ice chest from Rubbermaid is made right here in the USA from BPA-free materials. If you find it hard to justify spending the asking price for a Yeti cooler, perhaps the Igloo brand would appeal to you. Not only is it affordable, it is also made out of the same Polyethylene material like the most popular yeti cooler brand. The body comes with unique insulation that guarantees it can hold your ice solid for up to 7 days in temperatures reaching up to 90 degrees Fahrenheit. The lid comes with handles that are designed to swing up. Within the design, there are latches to ensure the lid is securely closed tight, which will make it harder for wild animals to get to your food and beverages. This cooler from Igloo brand is available in two distinctive sizes and comes with the right type of easy draining setup. 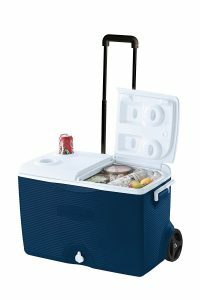 The only brand in my opinion that comes close to matching the design and performance of the yeti tundra 65 ice chest is the RTIC cooler. The similarity is quite obvious for all to see, but the manufacturer claims it can hold ice solid for up to ten days due to the superior insulation technology used. The latches are made using heavy duty rubber materials and it comes with a built-in locking system to keep your food and beverages safe from the wild animals. 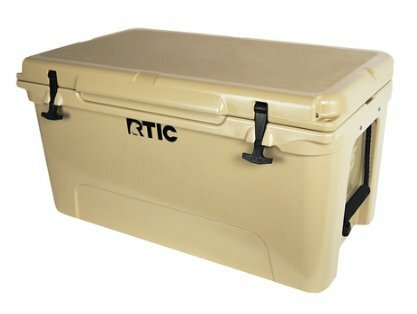 The RTIC cooler is capable of holding up to 65 quarts and can be used on camping trips including those involving hunting or fishing. The tough outer exterior makes it the ideal ice chest to withstand the outdoor elements. The warranty is only for thirty days, which is more than enough time to give it a try and judge for yourself if it is comparable to the performance of a yeti cooler. You might search all you want for coolers that are similar to yeti, but the original will always outperform imitators when used indoors or outdoors. 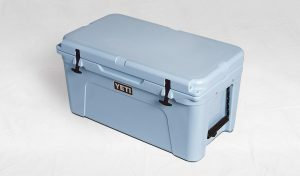 The Yeti tundra is available for purchase in three unique colors. The included latches are made out of durable, tough, and heavy-duty rubber materials. The lining wall for this cooler is thick, and it comes with a unique type of insulation called permafrost. If you enjoy camping, fishing, or hunting animals in the wild, the rugged design of this cooler from yeti will withstand much abuse as it will probably not break apart. The yeti tundra 65 is probably the most impressive cooler for any backyard barbecue. You’ll find this ice chest comes with plenty of room to hold different types of beverages at the right cold temperature. 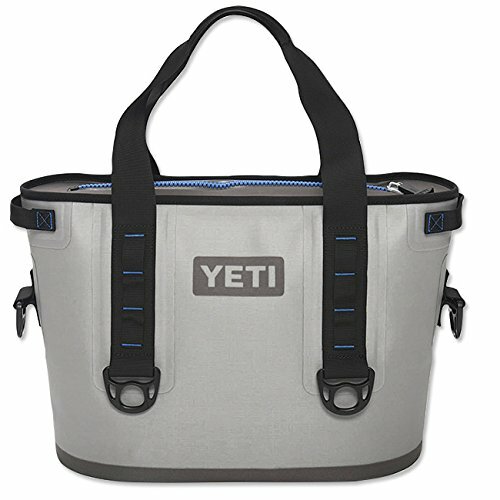 Other coolers on the market have tried to imitate the Yeti design and performance, but I am yet to find one that comes close to matching it. Forget the other coolers like yeti, get yourself a cooler from yeti if you can afford it, for it will last you a lifetime. If you want a cooler with high-end design and made out of stainless steel for entertaining in your backyard, TRINITY TXK-0802 cooler is just the right product. Your guest might think it is a small refrigerator, for it comes with a shelf, lid, and rolling leg wheels. The legs include locking mechanisms for two, which not only help helps with mobility but also when you need to make it stationary. Impress your guest with the attached bottle opener accessory that also includes a cap catcher. 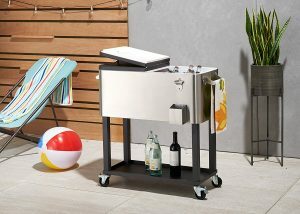 This cooler with rolling legs is designed for use in your backyard or porch, and the sleek design will impress all that come in contact with the product. The TRINITY TXK-0802 is the ultimate backyard barbecue cooler for the hot summer months. If you dislike carrying stuff with your muscles, perhaps the coolers with wheels will be more to your liking. The most desirable rolling cooler for the beach can also be used anywhere outdoors. Below are the two coolers on wheels with the highest performance one can find online. Rarely do you find ice chest reviews online without a product from this brand? This Rubbermaid ice chest is designed to help keep both food and beverages cold. This cooler is resistant to both odors and stains and comes with a liner that is easy to keep clean. 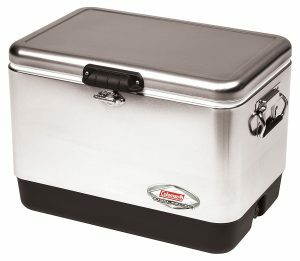 Not only is the Rubbermaid ice chest capable of holding up to 60-quart, it is also made in the United States of America. Igloo is another brand you’ll find in any cooler reviews. It is certainly one of the best coolers for the beach when you consider that it is made out of strong Polyethylene material. The unique design of the handle makes it quite easy to lift heavy loads. The body of the Igloo glide Pro cooler is insulated, which gives the ability to keep ice solid for up to 5-days, at temperatures up to 90 degrees Fahrenheit. The wheels are large enough to ensure less use of your muscles as you pull a full load of your favorite beverages. The rugged design is complimented with hinges that are made out of zinc, which guarantees this product will last many decades with the right care.